Please join Marvin Test Solutions at these upcoming events in the Washington, D.C. area. Both will be held at the Gaylord National Resort & Convention Center in National Harbor, MD, with opportunities for attendees to visit both exhibitions during the week. We look forward to seeing you at either or both, to discuss your mil/aero test challenges, and to demonstrate how We Make Test Easy™. To schedule a meeting, please contact JessicaD@MarvinTest.com. IEEE AUTOTESTCON (September 17 - 20) is the world's premier conference that brings together the military & aerospace automatic test industry and government & military acquirers and users to share new technologies, discuss innovative applications, and exhibit products and services. In addition to presenting papers at the conference and participating in the informative panel sessions, MTS will display our advanced test solutions that ensure readiness for mission-critical applications. For more information or to register for the event, visit autotestcon.com. MTS-3060 SmartCan™ - Universal O-Level armament test set capable of testing both legacy and "smart", MIL-STD 1760-based, weapons systems. SmartCan supports multiple Operational Flight Profiles (OFP) in a hand-held unit. MT1888 Series Laser Source Simulator - Technically-compliant and an easy-to use, best-value solution, the MT1888 offers simple, O-Level Laser Guided Missile seeker testing. PATS-70 Flightline Test System - Based on the MTS-207 Rugged Field Test Set, the USAF’s PATS-70 replaces over a dozen pieces of obsolete and un-supportable flightline test equipment. The 2018 AFA (Air Force Association) Air, Space & Cyber Conference (September 17 - 19) is the nation's premier event for defense and aerospace professionals from across the United States and abroad. As a strong supporter of the United States Air Force and its global counterparts, The Marvin Group will be represented at the event by Marvin Test Solutions and Marvin Engineering Company. The Marvin Group has a 50-year history of development, delivery and support of world-leading aerospace and defense equipment, including AME (Alternate Mission Equipment) and cross-platform test solutions for the flightline, backshop and depot. Registration for the technology expo is free with a government-issued ID. For more information or to register for the event, visit afa.org/airspacecyber/home. MTS-3060 SmartCan™ - Universal O-Level armament test set capable of testing both legacy and "smart", MIL-STD 1760-based, weapons systems. SmartCan supports multiple Operational Flight Profiles (OFP) in a handheld unit. MTS-206 Maverick Test Set - State-of-the-art portable test set for the AGM-65 Maverick missile system and for AGM-114 missiles with the test capabilities of an I-Level test set in a compact, rugged enclosure suitable for field use. 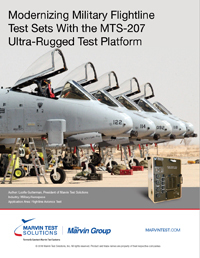 The MTS-206, MTS-916 and MT-1888 products offer the only non-obsolete and common test equipment solution today for the Maverick Missile and launcher. PATS-70 Flightline Test System - Based on the MTS-207 Rugged Field Test Set, the USAF’s PATS-70 replaces over a dozen pieces of obsolete and unsupportable flightline test equipment. MTS-235 F-35 Armament Test Set - State-of-the-art portable test set for various armament systems used on the F-35 Joint Strike Fighter including launchers, pylons, and racks. It combines the test capabilities of an I-Level test set in a compact, rugged, flightline qualified enclosure. 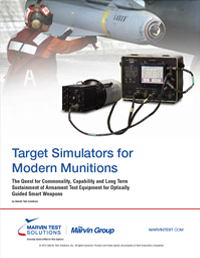 Download "Target Simulators for Modern Munitions"
Download "Modernizing Military Flightline Test Sets"